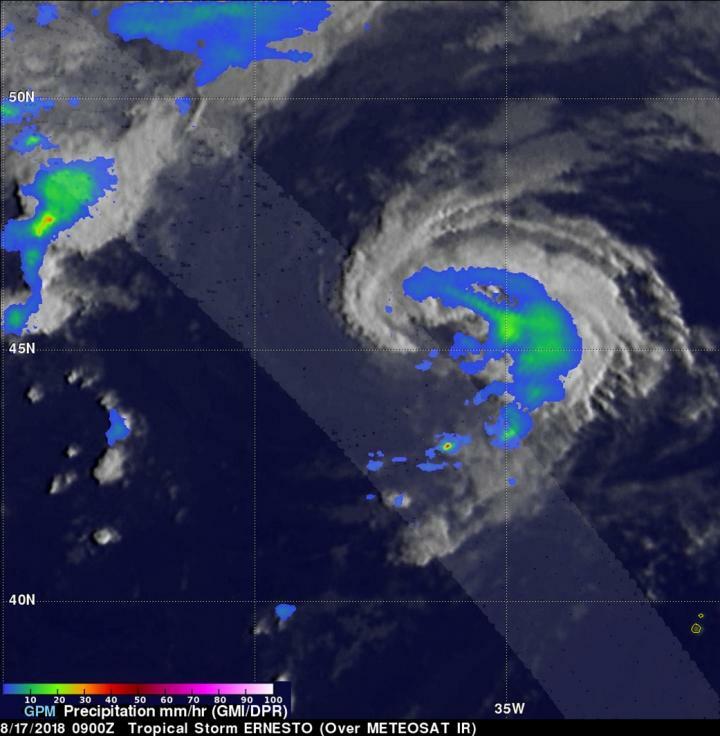 NASA found light to moderate rainfall occurring in Tropical Storm Ernesto as it continued on an eastern trek toward Ireland and the United Kingdom. Ireland has already issued a warning for Ernesto. Sub-tropical storm has taken on tropical characteristics and was renamed a tropical storm by NOAA's National Hurricane Center. On Aug. 17, the Irish Meteorological Service or IMS issued a Status Yellow Weather Advisory for Ireland. The advisory cautioned "High intensity rainfall over a relatively short period of time for many areas on Saturday night associated with the remnants of Tropical Storm Ernesto. Totals up to [0.78 inch] 20 mm could occur quite widely with higher falls locally. The situation will continue to be monitored." For updates from the IMS, visit: https://www.met.ie/. The Global Precipitation Measurement mission or GPM found rain falling at a rate of about 1.2 inches (30 millimeters) per hour east of center. Rainfall around the rest of the system appeared light, except for the western quadrant that appeared devoid of rain. GPM is a joint mission between NASA and the Japan Aerospace Exploration Agency, JAXA. At 11 a.m. EDT (1500 UTC), the National Hurricane Center or NHC said the center of Tropical Storm Ernesto was located near 47.1 degrees north latitude and 32.9 degrees west longitude. Ernesto is moving toward the northeast near 30 mph (48 kph), and an even faster motion toward the northeast or east-northeast is expected during the next day or two. Maximum sustained winds are near 45 mph (75 km/h) with higher gusts. The NHC said "Ernesto is somewhat surprisingly maintaining convection and well-defined banding features over the northern and eastern portions of its circulation despite being over sea surface temperatures of 20 to 21 degrees Celsius (68 to 69.8 degrees Fahrenheit)." NHC noted that while little change in strength is forecast during the next 36 hours, Ernesto is expected to become a post-tropical cyclone tonight and then become extratropical as it merges with a frontal zone on Saturday, Aug. 18. On the forecast track, the post-tropical cyclone or its remnants will move across Ireland and the United Kingdom Saturday night.